Benchmark share indices gained over 2% on Tuesday to end at 1-month highs, on the back of positive cues from Asia and Europe, led by index heavyweight Reliance Industries and financial shares. The markets strengthened further post Moody's upgraded India's rating to investment grade. The 30-share Sensex ended at 16,165 up 350 points or 2% and the 50-share Nifty ended at 4,850 up 107 points or 2%. The Sensex and the Nifty reached an intra-day high of 16,181 levels and 4,856 mark, respectively. The Sensex hit 16,100 mark, its highest level since December 14, 2011. On the global front, Asian markets ended firm today with Shanghai outperforming everyone with 3% rise post robust economic trade data. Hang Seng, Nikkei, Shanghai Composite, Taiwan Weighted, and Straits Times gained between 1-2%. Firm opening of the European markets during late noon trades further boosted sentiment amongst local investors. The CAC-40, DAX and FTSE-100 were up between 1-2%. Back home, appreciation in rupee value against dollar too cheered the sentiments amongst local investors. 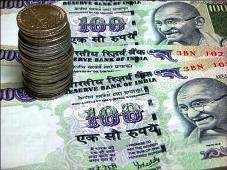 The rupee rose 0.72% on Tuesday to touch its highest level in a month, propelled by the surge in domestic equities and robust dollar inflows into local debt. Mr D. K. Aggarwal, CMD, SMC Investments and Advisors Limited says, "The markets were in over-sold zone, finding buying interest from value pickers. Further, news that Moody's upgraded Indian sovereign ratings is a big positive to the overall sentiment. Lastly, the results which started with IndusInd bank, has commenced on positive note, as IndusInd bank has beaten the market estimates. Even, technical's are also indicating that nifty is in short term uptrend and will see the first resistance at about 5,000 level". All the 13 sectoral indices on BSE ended in green zone. Index heavyweight Reliance Industries spurted by 4% to Rs 735. Shares of oil marketing companies like BPCL, HPCL, IOC and GAIL ended firm as BG Asia Pacific Holdings Pte Ltd (BG) starts its stake sale process in Gujarat Gas Company. to support the slowing economy. SBI, ICICI Bank, HDFC Bank and HDFC surged between 2-4%. BSE Bankex surged by 3%. Capital Goods majors like L&T and BHEL surmounted between 2-4%. BSE Metal index gained 2%. Hindalco Industries, Jindal Steel & Power, JSW Steel, Hindustan Zinc and Sterlite Industries gained between 1-4%. Tata Steel gained by nearly 3%. The company said yesterday that sales from its Indian operations fell 1.1% to 1.62 million tonnes in Q3 December 2011 over Q3 December 2010. M&M was the top Sensex gainer, rising 6%. Other auto majors like Tata Motors, Bajaj Auto, Maruti Suzuki and Hero MotoCorop accelerated between 2-3%. Auto stocks firmed up as car sales in India rose an annual 8.5% in December, an industry body said on Tuesday, the second consecutive monthly rise as the industry continued to rebound from record falls in sales in late 2011. Technology stocks like Infosys and Wipro spurted between 0.2-1%% ahead of Infosys earnings on Thursday. However, TCS ended marginally in red. Telecom major Bharti Airtel zoomed by nearly 3%. Amongst FMCG segment, ITC and HUL gained by nearly 1% each. The broader indices performed in line with benchmark indices; the BSE Midcap Index was up 2.2% and Smallcap was up 2.6%. Construction shares like HCC, IRB Infrastructure Developers, NCC, Patel Engineering, and Jaiprakash Associates gained by between 2-8%. Shares related to education business also made smart gains. Educomp Solutions, ACE EduTrend, Edserv Softsystems, Aptech, and Everonn Education jumped between 4-20%. In the sugar space, Bajaj Hindusthan, Shree Renuka and Triveni Engg ended up between 2-6%. Kale Consultants hit the upper circuit filter limit for the day of 20% at Rs 136.25 after its board declared a special interim dividend of 135% or Rs 13.50 per equity share on face value of Rs 10 per share. The market breadth in BSE ended extremely firm with 2,137 shares advancing and 671 shares declining.